A Steam Turbine is a mechanical device that extracts thermal energy from pressurized steam and transforms it into mechanical work. A Steam Turbine is a mechanical device that extracts thermal energy from pressurized steam and transforms it into mechanical work. Because the turbine generates rotary motion, it is particularly suited to driving electrical generators – about 90% of all electricity generation in the United States (1996) is by use of steam turbines Wiser, Wendell H. (2000). Energy resources: occurrence, production, conversion, use. Birkhäuser. p. 190. ISBN 978-0-387-98744-6. Wiser, Wendell H. (2000). Energy resources: occurrence, production, conversion, use. Birkhäuser. p. 190. ISBN 978-0-387-98744-6. Wiser, Wendell H. (2000). Energy resources: occurrence, production, conversion, use. Birkhäuser. p. 190. ISBN 978-0-387-98744-6. Wiser, Wendell H. (2000). Energy resources: occurrence, production, conversion, use. Birkhäuser. p. 190. ISBN 978-0-387-98744-6. Wiser, Wendell H. (2000). Energy resources: occurrence, production, conversion, use. Birkhäuser. p. 190. ISBN 978-0-387-98744-6. Wiser, Wendell H. (2000). Energy resources: occurrence, production, conversion, use. Birkhäuser. p. 190. ISBN 978-0-387-98744-6. ​ Wiser, Wendell H. (2000). Energy resources: occurrence, production, conversion, use. Birkhäuser. p. 190. ISBN 978-0-387-98744-6. . Sir Charles A. Parsons invented the first modern turbine, a reaction turbine, in 1884. Connected to a dynamo, the turbine produced 7.5 KW of electricity. During Parsons’ lifetime, this generation capacity increased 10,000 times over. Steam turbines range from <0.75 KW units to 1.5 GW units. Large turbines are used to generate electricity. As the name implies, a steam turbine is powered by steam. As hot, gaseous steam flows past the turbine' spinning blades, steam expands and cools, giving off most of the energy it contains. This steam spins the blades continuously. The blades thus convert most of the steam's potential energy into kinetic energy. The turbine is then used to run a generator, producing electricity. The basic parts of stream turbines are blades and rotors. A set of blades is known as a stage. They also have steam inlets (usually a set of nozzles) and outlets. Two independent mechanisms, known as governors, are used to ensure safe operation of the turbine. Impulse turbine:The rotating blades are like deep buckets. High-velocity jets of incoming steam from carefully shaped nozzles kick into the blades, pushing them around with a series of impulses, and bouncing off to the other side with a similar pressure but much-reduced velocity. Steam turbines use high-pressure steam to turn electricity generators at incredibly high speeds, so they rotate much faster than either wind or water turbines. For example, a typical power plant steam turbine rotates at 1800–3600 repetitions per minute (RPM); about 100–200 times faster than the blades spin on a typical wind turbine, which needs to use a gearbox to drive a generator quickly enough to make electricity Chris Woodford, “Steam turbines”. Last updated: July 19, 2014, from http://www.explainthatstuff.com/steam-turbines.html Parsons, Sir Charles A., "The Steam Turbine", p. 7-8. Cambridge University Press. Chris Woodford, “Steam turbines”. Last updated: July 19, 2014, from http://www.explainthatstuff.com/steam-turbines.html Parsons, Sir Charles A., "The Steam Turbine", p. 7-8. Cambridge University Press. Chris Woodford, “Steam turbines”. Last updated: July 19, 2014, from http://www.explainthatstuff.com/steam-turbines.html Parsons, Sir Charles A., "The Steam Turbine", p. 7-8. Cambridge University Press. Chris Woodford, “Steam turbines”. Last updated: July 19, 2014, from http://www.explainthatstuff.com/steam-turbines.html Parsons, Sir Charles A., "The Steam Turbine", p. 7-8. Cambridge University Press. Chris Woodford, “Steam turbines”. Last updated: July 19, 2014, from http://www.explainthatstuff.com/steam-turbines.html Parsons, Sir Charles A., "The Steam Turbine", p. 7-8. Cambridge University Press. Chris Woodford, “Steam turbines”. Last updated: July 19, 2014, from http://www.explainthatstuff.com/steam-turbines.html Parsons, Sir Charles A., "The Steam Turbine", p. 7-8. Cambridge University Press. Chris Woodford, “Steam turbines”. Last updated: July 19, 2014, from http://www.explainthatstuff.com/steam-turbines.html Parsons, Sir Charles A., "The Steam Turbine", p. 7-8. Cambridge University Press. . A steam turbine is also significantly more compact than a steam engine, one reason why steam turbines were quickly adopted for powering ships where space was very limited. While steam turbines are efficient and can be widely used in many different applications, the generation of the steam requires a thermal energy source. Steam turbines are commonly powered by fossil fuels such as coal. Nuclear energy is also a common resource used to power steam engines. In the renewable energy world, concentrated thermal plants are a common resource for generating steam. Depending on the resource used for the input, steam turbines can have varying negative impacts on the environment and human health. a, b, c Chris Woodford, “Steam turbines”. Last updated: July 19, 2014, from http://www.explainthatstuff.com/steam-turbines.html Parsons, Sir Charles A., "The Steam Turbine", p. 7-8. Cambridge University Press. Sorry, we do not yet have a video specifically for Steam Turbines. We are adding new videos to StudentEnergy.org weekly, but in the meantime check out this video on Electricity. 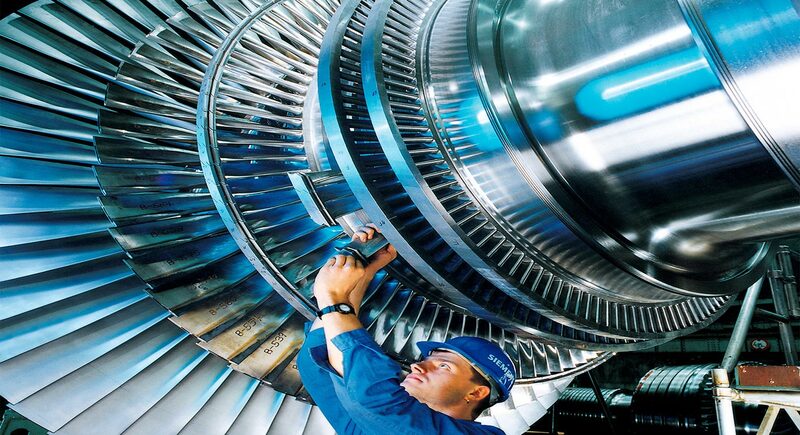 Gas turbines, also called combustion turbines, generate power using pressurized gas.